The Branson Tri-Lakes News offers many opportunities for commercial printing customers. We have a 12-unit Goss Community press with two 4-high press units to provide vivid process color printing for your publication. 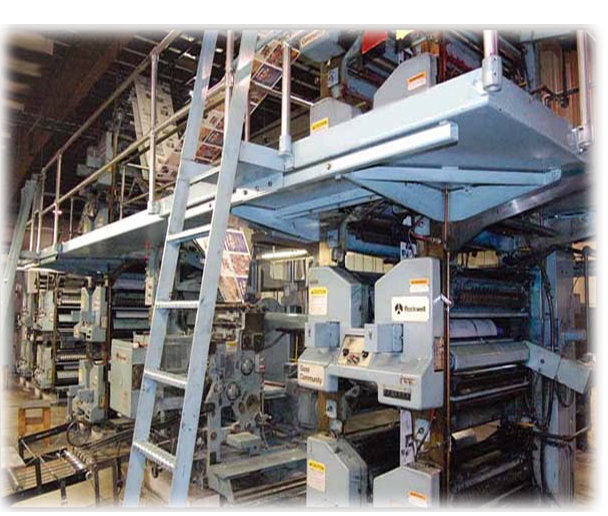 We can print full process color on every page of a 12-page broadsheet or a 24-page tabloid publication. We currently print on standard newsprint as well as on grades up page up to 40# high bright. Other paper grades are available per request. For non-web customers, we also offer sheet-fed gloss printing for flyers, brochures, magazines and rack cards on our state-of-the-art Ryobi press. The Branson Tri-Lakes saddle-stitch/trimmer/collator machines are ready to work for you. We offer full FTP page downloads, proofing, stitching and trimming for your publication as needed by you. Inserting, labeling, bundling, boxing, palletizing, wrapping, shipping and delivery services are available. Contact Publisher Michael Schuver or Business Manager Robert Erickson for more information at 417-334-3161.